CFOs can see that the rate of change in health care is faster than ever and the price of making the wrong move or no move is too high to pay. 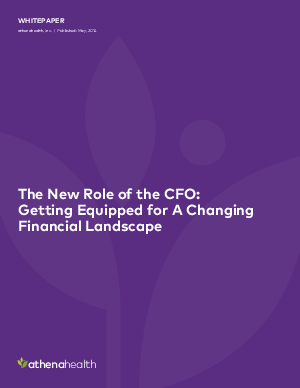 Whenever possible – especially at larger health systems – CFOs need to delegate core activities, such as revenue cycle management, to capable controllers and VPs of finance so they can focus even more on the financial strategies that will drive long term viability. 1)Optimizing the health system’s fiscal health. Even if it’s already good it needs to be even better to weather inevitable industry changes. 2)Thinking outside the walls of the health system by optimizing the ecosystem of providers, the system of care, and physician loyalty. 3)Optimizing the patient experience: harness the health system to deliver what patients value most.